Deseed and cut the pepper into small pieces. Deseed and finely chop the green chilli. Slice the cherry tomatoes into quarters. Cut the green beans into small pieces. Place the pepper, chilli, tomatoes and green beans into a medium sized serving bowl. Stir through the drained sweetcorn, olive oil, lime juice and zest. Roughly chop the coriander and stir through the salsa to serve. 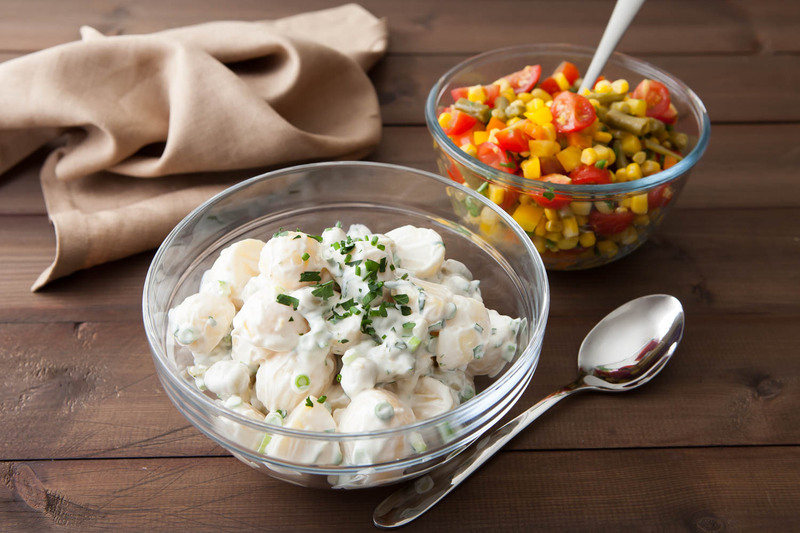 Stir together the mayonnaise, crème fraiche, lemon zest and 1 tbsp juice in a medium bowl. Halve the new potatoes and finely slice the spring onions. Gently stir into the mayonnaise mixture with the broad beans, until all the ingredients are coated. Finely chop the parsley and chives. Stir through the potato mixture and serve.